A long-awaited government report into structural problems in a major Cornish road tunnel has been published. 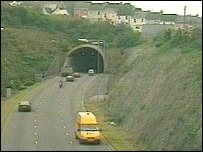 It reveals that the Highways Agency was told there would be cracks in the Saltash Tunnel before it was even built. Taxpayers will now have to foot the bill for repairs. South East Cornwall MP Colin Breed raised the tunnel's problems in the House of Commons during an adjournment debate 10 days ago. He argued that taxpayers should not have to pay for repairs because it was badly designed in the first place. But the report shows the developers, Mott McDonald, are not at fault as they highlighted potential problems before work started on the tunnel 14 years ago. Mr Breed says if the original design had been changed the building project would probably have gone over budget. But he is angry that it has taken so long to sort out the problems, saying it should have been dealt with at least a decade ago.